If you are wondering where you can find Izakaya in Kyoto, the Japanese style bar, this is where we highly recommend! It is easy to access as located right next to Kyoto Station. If you go to a random Izakaya, you may often be disappointed as it is too noisy, or the food is not what you have expected. However, if you visit Manzara-tei, you may feel the difference from the regular Izakaya as they offer the relaxing atmosphere. The sophisticated interior design also makes you feel comfortable. They provide “Obanzai”, light Kyoto-style home cooking with boiled vegetables and marinated food, and it is worth trying! You will surely enjoy the atmosphere of Japanese style bar "Izakaya" and also the Kyoto style food as well as the bar dishes! 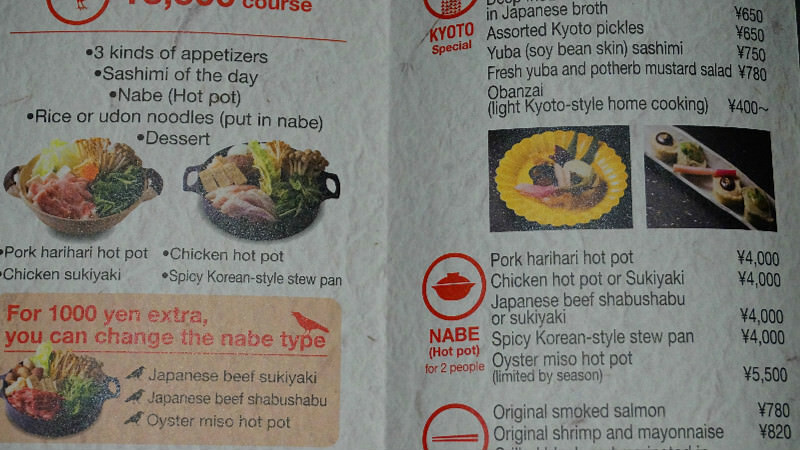 Sukiyaki is getting popular in overseas recently. For those who are not familiar with this dish, sukiyaki is a hot pot with thin slices of beef, various vegetables, tofu and some other ingredients. This set is usually for two people. As a raw egg would come along with it, please break them and mix it well. Then, dip the ingredients from the hot pot to the raw egg. This raw egg makes this sukiyaki milder, but if you have a difficulty of eating raw eggs, you can just have sukiyaki without it. It has enough taste already into the ingredients. This sushi is surprisingly tasty and fresh! The fish are changeable depending on the season, but they are all well-chosen and makes you satisfied by its taste and the volume. They are also beautifully lined up, so you may want to take a photo of this sushi plate! Agedashi dofu is a dish of tofu lightly dusted with starch or flour, then deep fried, and served in dashi broth or dashi-based sauce seasoning with soy sauce. As it is deep-fried, it is hot and good to be eaten in the cold weather. You can have a spoon since it is easy to eat with it rather than chopsticks. This is a grilled black cod with the Kyoto style sweet miso. It is very soft but juicy and the sweet Kyoto style miso called Saikyo-miso is well marinated in the fish. If you could taste it with some alcohol such as beer, it would be even tastier. Please break the egg on your plate and mix it. Then dip the ingredients from the hot pot as you wish. If you have a difficulty in having raw egg, you don’t need to dip into it. Ingredients from the hot pot already have enough taste. If you want to reduce or add more Wasabi, Japanese horseradish, you can ask the staff to do so. I certainly liked this Izakaya! I usually don’t go to Izakaya, but the atmosphere of this bar was more relaxing and calm. So if you are looking for a Japanese style bar that you can also enjoy the atmosphere and the tasty food, we recommend that you visit this Izakaya! As several English menus are available, you may feel more comfortable ordering and making some dishes by yourself. 5-minute walk from JR Kyoto Stn. There are several English menus available. 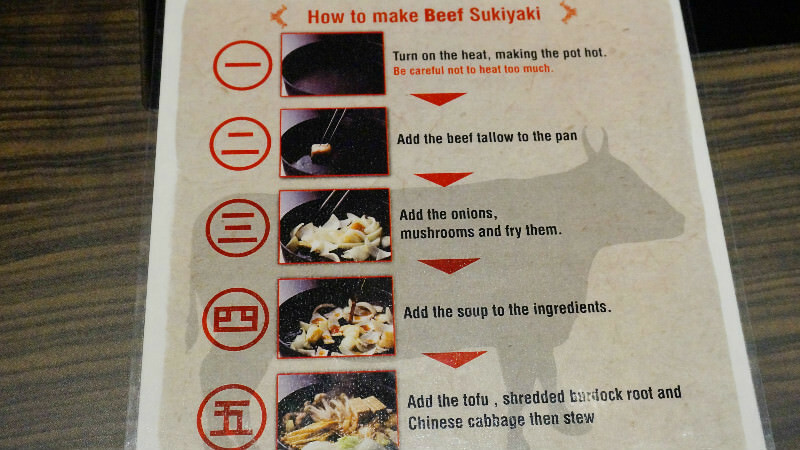 There are also the process of making sukiyaki, so it is easy to make it by yourself!